DIN Standards are invented for a variety of components including industrial fasteners as DIN 580 Lifting Eye Bolts. DIN 580 Lifting Eye Bolts are manufactured from Austenitic Steel Grade A2, A3, A4 and A5, Brass, Plain Stainless Steel, Alloy Steel, Ordinary alloy steel or many other materials. 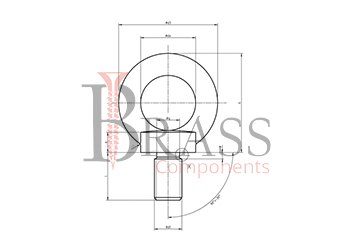 DIN 580 Bolts are available in a wide range of sizes, shapes and materials. Fully threaded or Partially Threaded. Can’t be assembled against a surface which differ essentially from a surface perpendicular to the direction of lift. Standard specify the lifting capacity of Eye Bolts. Complies GOST 4751-73 and ISO 3266 standards. Increased requirements in an area of importance for safety. Achieve complete contact between the two mating faces. Offer high load capacity and tested to meet the high safety standards. The lifting eyes screwed tight against the surface. 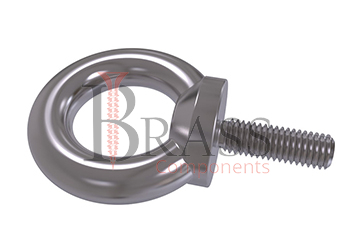 The material of the mounting surface must have the same mechanical features of the eyebolts. Used in Construction, Fastening, Ship-building and Lifting Equipment. Designed to grip, lift and move machines, mechanisms, metal structures during installation, disassembly or transportation. Can be used in a temperature range -20 ° C to +200 ° C without limiting the load capacity. Used as permanent attachments on equipment such as control cabinets, motors, gear boxes, etc. We manufacture DIN 580 Bolts as per Custom Specification and export in Germany, Spain, Netherlands, Portugal, UK and other European Countries. For more Information, Please Contact Us or Inquiry Now.